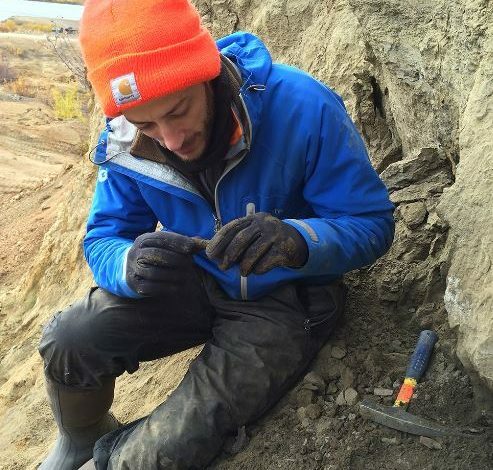 Dr. Brian Schubert and an international team of other geoscientists spent a couple of recent summers digging in Siberian sediments, unearthing fossilized wood that’s millions of years old. Their research has prompted them to predict that variability in rainfall will increase in the Arctic due to climate change. Schubert, an assistant professor in the University of Louisiana at Lafayette’s School of Geosciences, and A. Hope Jahren of the University of Oslo, Norway; Sergei P. Davydov of the Russian Academy of Sciences; and Sophie Warny of LSU plucked fossils from the sides of Russian riverbanks. Water had carved away layers of sediment and exposed fossils that were deposited between 5.3 to 11.6 millions years ago. The team studied chemical changes in the growth rings of trees and plants from the period, which is known as the Miocene Epoch. Small changes in the ratio of two carbon isotopes in the growth rings of fossil wood shed light on rainfall patterns. “This ratio is affected by the amount of precipitation the plant receives and reflects an effort by the plant to conserve water that would otherwise be lost to the atmosphere,” Schubert explained. Ascertaining rainfall during the time period is important because global temperatures and changing sea ice cover at the time were similar to conditions of today, only in reverse. “An interesting aspect of the late Miocene is that temperatures and carbon dioxide levels were getting lower and ice started to form. By studying this time period, we wanted to see if this change in sea ice drove any changes across the climate,” Schubert said. The scientists compared their findings from the Miocene to modern samples they collected and data compiled from the region over the last several decades. They concluded the Arctic will likely experience more rain in ensuing years as a result of global warming. “Arctic sea ice decline results in an increase in evaporation. Since areas that used to be covered in ice are now open water, it means there is more evaporation into the atmosphere and more precipitation across the Arctic,” Schubert said. The findings are detailed in a recent Geology article. Schubert was the lead author. The journal is published by the Geological Society of America, which was founded in 1888. Its journal is the most widely read in the field of earth science, according to the society’s website.